The yellow crocus responds to a temperature shift from cold to warm. This blossom was plucked on a cold night and had fully opened in less than an hour when brought into a warm room. The Air Flow(er) is an energy independent thermally active ventilation device which behaves like a flower, whose “petals” open wide when exposed to warmer temperatures. Building on principles found in nature, the Air Flow(er) aims to regulate airflow and interior temperatures—without electricity. Conceptually the Air Flow(er) is based on the thermonastic response of the yellow crocus. Thermonasty describes the kinetic reaction of plant structure in response to changes in temperature. 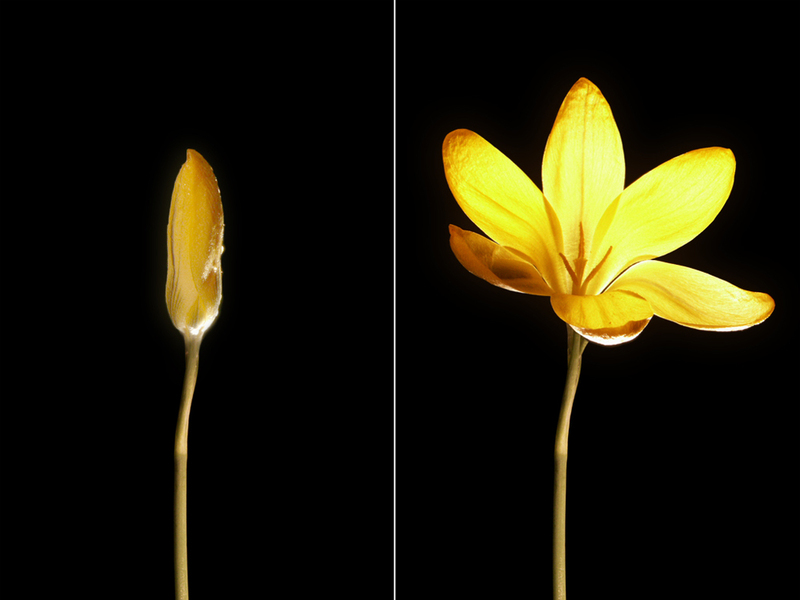 The yellow crocus flower, reacts to a temperature shift from cold to warm. Studies have shown that the physiologic properties of the petal are responsible for its kinetic response to temperature. The petal comprises two layers of cells, one inside and one outside. In cold temperatures, the outer layer of cells expands at a faster rate than the inner layer, and the petals move inward causing the flower to close. In a warmer environment, cell growth of the inner layer outpaces the outer layer and the flower blooms. This intrinsic kinetic response to temperature, immediate and without any higher level processing system proved to be the impetus for a comprehensive investigation into other smart materials that could perform in a similar way. The active component in the Air Flow(er) device is a custom manufactured Shape Memory Alloy (SMA) wire, which is commonly regarded as a smart material because of its unique response to changes in temperature. When an SMA is in its lower temperature form (martensite phase), it can be easily deformed into a new shape. This can be caused by bending, stretching, twisting, flexing, or otherwise distorting the wire from its original shape. However, when the alloy is heated through its warmer transformation temperatures (austenite phase), it recovers its original shape with great force. This process is known as Shape Memory. To test the device, a small wooden box was built with a square hole in the top to accommodate the prototype. A heat gun was used to slowly bring the temperature inside the box to 150°F - ultimately causing the wires to contract and the panels to open. After the heat is removed, the wires begin to cool off and the elastic cords gently pull each panel back into its closed position. 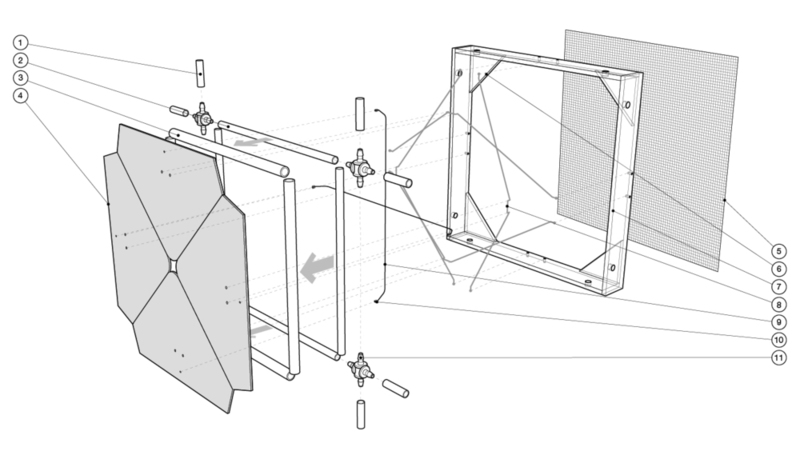 The four leaf prototype could be used as the operable blind or shade on either the exterior or interior face of a naturally ventilated double-skin facade system. The main advantage of a double-skin façade is the greater control they provide over the thermal/fluid exchange between the perimeter zone and the outside environment. In the summer, the cavity between the inner and outer skin could be vented out of the building through the Air Flow-er’s automatic response to rising temperatures – mitigating solar gain and decreasing the cooling load on the building’s mechanical equipment. In the winter, a double-skin facade can act as a passive solar heater by using the Air Flow-er to seal the cavity and using the absorbed radiation to minimize the façade heat loss. Rendering of the Air Flow(er) deployed as an automatic thermally responsive opening in either a double or single skin facade system. When SMA wires are in their martensitic state, the wire can be strained by as much as 8%. However, when the alloy is heated through its transformation temperatures, it reverts to austenite and recovers its previous shape with great force. This process is known as Shape Memory. There are many different alloy compositions that display the Shape Memory Effect; yet the most common is a simple binary mixture of nickel and titanium. SMA’s are a family of materials that cannot be completely described using typical engineering properties. Subtle adjustments in the ratio of the two elements make a large difference in the properties, particularly the transformation temperatures. Differences of less than one percent of atomic weight of either element, or the introduction of contaminants like iron or oxygen can change the transition temperatures by by as much as 100°C. This is important, because changing the elements of the SMA wires can allow calibration for different environmental zones and applications on a building. Three physical prototypes were developed and tested for various building applications: a roof vent, a traditional single skin aperture, and a naturally ventilated double skin façade system. All of the prototypes were designed to facilitate natural ventilation in buildings and are completely energy independent. As a building heats up past a specific temperature threshold (approximately 80°F), the panel system opens up to allow air to flow into a building. Once the interior space cools past its lower temperature threshold (approximately 60°F), the panels close to keep the temperature regulated at comfortable levels. An exploded axon drawing of the four-leaf prototype. Key: 1) rigid connector tubes, 2) inner tubes, 3) outer tubes, 4) panels, 5) wire mesh screen, 6) gusset plates, 7) frame, 8) elastic cords tied between panels and outer frame, 9) Shape Memory Alloy wires, 10) barrel crimp, 11) four-way connectors. Perhaps the greatest benefit of the present invention is the fact that it is completely energy independent. That is to say, it requires zero electrical input to operate the ventilation device. This means that energy demands that are typically allocated to mechanically operated ventilation systems can be dramatically reduced. In 2001, the Environmental Information Administration reported that 78% of all single family homes had some form of air conditioning system (central system, window/wall unit - or both). This coupled with the fact that the buildings sector accounts for nearly 40% of the electricity usage in the United States means that our buildings are using massive amounts of our nation’s natural resources. Mounting energy prices and growing awareness of global warming have property owners and builders looking for ways to reduce their energy costs. These efforts become more important as state and federal governments implement mandates and incentives to push sustainable building in order to cut carbon emissions and reduce the strain on our nation’s electric grid. Owners and developers of new and existing buildings can use the Air Flow(er) to lower their energy expenses through passive ventilation, even under the most demanding of situations. Because the panels open and close according to the material characteristics of the SMA wire, there are no complicated sensors, circuits, or processing devices required to operate the system. This means low maintenance and operating costs. The Air Flow-er’s modularity allows it to be combined to fit almost any opening and can be used to retro-fit existing buildings to make them more efficient, or used in new LEED certified construction. Shown in the open and closed positions, the two leaf prototype features a slide bar which regulates the motion of each panel and an overlapping panel design which ensures a water tight seal for single skin applications. Shown in the open and closed positions, the design of the single leaf prototype allows multiple SMA wires to act in parallel - generating much larger pull forces and allowing for a greater overall panel dimension. As a horizontal system, the single leaf prototype could be applied to the roof of a large vertical space, like an atrium in a high-rise building, or in towers mounted to the roof of a structure to create natural ventilation through “stack effect”. The stack effect is the passive movement of air into and out of buildings, through the use of positive or negative buoyancy forces. Buoyancy occurs due to a difference in indoor-to-outdoor air density typically resulting from temperature and moisture differences. The greater the thermal difference and height of the structure, the greater the buoyancy force and larger driving force for natural ventilation. Natural air currents can be created when the hot air inside a building rises up and out of a building, causing it to be replaced by cooler air drawn in from a lower area. If there is an opening at the top of a building and another below in the building, such as a door or window, a natural air flow will be created through the use of the stack effect. The single leaf prototype could be used at the top or bottom of a vertical space to automatically trigger the buoyancy forces that create comfortable natural ventilation inside a building.